Summary. 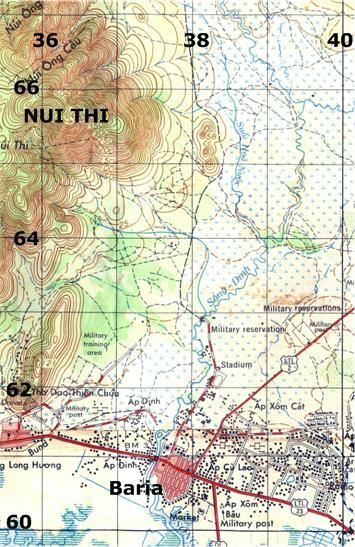 W3 Coy still had 9-days to go on Op CAPRICORN, then returned to NUI DAT and started a series of platoon and section strength patrols from the NUI DAT lines to the West of NUI DAT. Coy HQ and one platoon remained within NUI DAT during the remainder of the month. 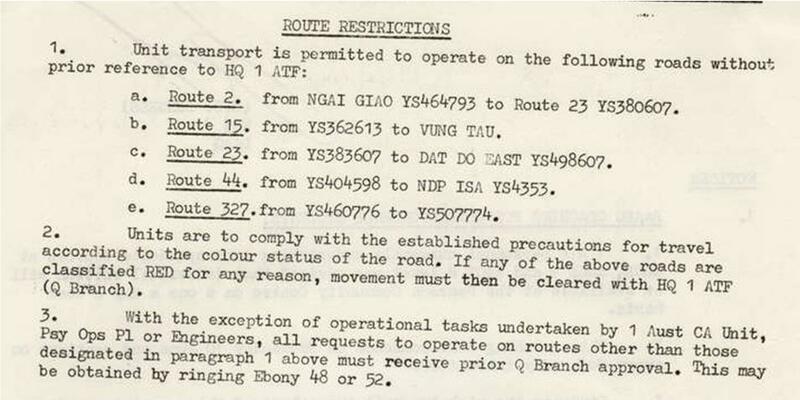 In common with other 1ATF units there was no significant operational contact with the VC once the Company's part in Op CAPRICORN finished, indeed the 1ATF Intelligence Summary for 8 - 14 Jun 70 reported a regular theme that "VC continue to avoid offensive action except for mining activity against opportunity targets - supply activity appears to be increasingly difficult - there were [only] 7 contacts by 1ATF in which 2 VC were killed and 4 probably killed". W Coy HQ had a number of New Zealand VIP visitors during the middle of the month. 1100H HQ W Coy and mor sect redeployed from FSB ZILLA to create a new FSB COOK at YS335653, probably secured by 3Pl who were operating in the general area, Pte Gurnick and Kennedy having been wounded nearby at YS338656. 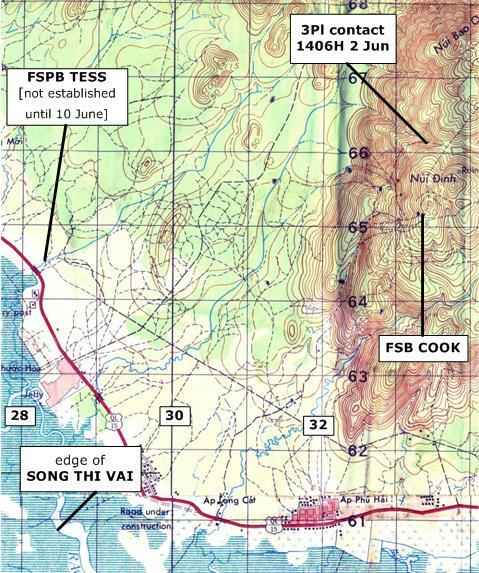 FSB COOK was basically on the highest point of the NUI DINH [SW point] and an ideal position for communications [height] and for mortar fire support [fire plunging down into re-entrants meant little cover]. 0945H at YS336658 3Pl discovered an enemy base camp area 100m x 30m, clean and well maintained, used by 2-3 VC 2-days prior, qty of equipment and explosives destroyed. Contact: 1406H at YS335661 3Pl contacted x7 VC, 1 VC KIA, 1 VC WIA [BT], 3x weapons captured including a pistol of UK origin. 7-packs containing medical supplies, 140lbs rice and 4lbs lentils, equipment and documents were also captured. The lead elements of the platoon strength patrol had initially heard talking and smelt smoke. Lt Fisher deployed the platoon on a wide frontage and swept from the north toward the VC camp which was at the bottom of a steep-sided re-entrant in an area of large boulders and thick secondary vegetation. When a VC moved out of the camp to a position where the platoon sweep was blocked he was shot by the gun group at 10 metres range and the platoon then fired into and swept through the location. The remaining VC returned fire with SA and RPG and fled west, a blood trail meant 1x VC was also wounded. 3Pl requested indirect fire support to suppress the VC withdrawal routes. Within 6-minutes of the contact starting 107 Bty RAA had the first of x42 105mm HE rounds landing near the contact, there had been a delay of 3-minutes while getting air clearance. The after-action report [item 29] states that the total of ammunition fired during or after the contact totalled 1500 [sic] rounds [M60 x800, M16 x400, SLR x400, M79 x40 and HE g renades x6, plus artillery and mortar rounds]. The after-action report is here. 1820H at YS316699 3Pl evacuated x1 NZ WIA [Lt John Fisher right] with a RPG shrapnel wound to his right ankle from the earlier contact, the wound was not discovered until after stand-down when the boot was removed. [date TBC: Lt Jim Cutler [left] flew into FSB COOK to replace Lt Bill Blair as platoon commander 1Pl. Lt Blair returned to NUI DAT to replace Capt Jim Brown MC as W Coy 2ic, Capt Brown being posted as Coy 2ic A Coy 2RAR/NZ at the request of CO 2RAR/NZ Lt Col Church]. Night Locations: HQ YS334653, 1Pl – YS327717, 2Pl YS325706, 3Pl YS316699. 1210H at YS312660 1Pl discovered and destroyed an unknown type of AP mine. 1325H at YS312656 2Pl located and destroyed a booby trapped unexploded 155mm artillery round. CO 1RNZIR Lt Col RG Williams visited 1ATF over the period 8-12 June, spending the period from 9 June with 2RAR/NZ, and departing by Wallaby Airlines [Caribou] late afternoon 12 June. From 0950H HQ B Coy redeployed by helicopter to FSB COOK relieving W Coy who returned to NUI DAT by foot then APC. Night Location: W Coy were complete in their lines at NUI DAT. Rainfall today trace [less than 0.1 mm rainfall (0.2 mm in the United States) is generally referred to as a trace]. a platoon remained in NUI DAT lines with Coy HQ to cover base tasks such as local protection and administration. a platoon conducted extended boat patrols through the mangroves of the SONG THI VAI as far north as the provincial border. For this task the boat sect from 1Fd Sqn [x4 boats and x4 coxswain] was assigned to W Coy from 120800H. 13 June was a Saturday. W Coy personnel in NUI DAT may have visited the performance of the Sydney Concert Party at 106 Fd Wksps. The leading entertainer was female vocalist Pat Carroll. Night Location: Coy HQ and 1Pl at NUI DAT, 2Pl(-) and armour at YS383658, YS378636, and YS373685, 3Pl(-) at YS206618 and YS251624. Norman Kirk Leader of the NZ Opposition accompanied by the NZ Ambassador visited W Coy at 1430H for 30-minutes. It was a flying visit, having arrived in 1ATF at 1345H he was airborne by 1530H visiting 161 Bty at FSB LE LOI on his way back to Saigon. Night Locations: Coy HQ and 1Pl NUI DAT, 2Pl at YS380649 and YS373637, 3Pl at YS226662 and YS373686. Night Locations: Coy HQ and 1Pl NUI DAT, 2Pl at YS380649, YS373637 and YS375678, 3Pl at FSB TESS. [16 June was the the 4th anniversary of the date in 1966 when 1ATF assumed command of Australian forces in PHUOC TUY Province]. 0930H at YS373633 2Pl detained x3 civilians found moving with empty food baskets, they were brought back to NUI DAT for questioning and released to SVN police as innocent. 1100H at YS256610 3Pl detained x3 females and x2 males only one of which had an ID card. They were questioned by Det Div Int Unit and released to SVN police as innocent. W Coy personnel in NUI DAT may have visited the second performance of the Sydney Concert Party, at Luscombe Bowl. Night Locations: Coy HQ and 1Pl NUI DAT, 2Pl at YS380649, YS379666 and YS373637, 3Pl YS295599 and YS274623. 1Pl deployed from NUI DAT while 2Pl replaced them as duty platoon in NUI DAT. Night Locations: Coy HQ and 2Pl NUI DAT, 1Pl at YS255644, 3Pl at YS381650, YS379674 and YS375639. Night Locations: Coy HQ and 2Pl NUI DAT, 1Pl at FSB TESS, 3Pl at YS375674 and YS375636. [19 June is Vietnamese Army Day - to mark the day 1ATF units donated commodities [surplus milk, coffee, preserved fruits and sweets] to the PHUOC TUY Society for Social Welfare of Servicemen's Families]. Night Locations: Coy HQ and 2Pl NUI DAT, 1Pl at YS286665, 3Pl at YS373644, YS375674 and YS375636. Night Locations: Coy HQ and 2Pl NUI DAT, 1Pl at YS362599, 3Pl at YS373644, YS379638 and YS377666. Night Locations: Coy HQ and 3Pl NUI DAT, 1Pl at YS381657, YS376644 and YS375675, 2Pl at YS365600. Night Locations: Coy HQ and 3Pl NUI DAT, 1Pl at YS381657, YS378662 and YS374641, 2Pl FSB TESS. Night Locations: Coy HQ and 3Pl NUI DAT, 1Pl at YS381657, YS378662 and YS374641, 2Pl YS247650. 2130H at YS387653 1Pl sentry's using a Starlight scope saw enemy movement 350 metres away and engaged, nil results. Night Locations: Coy HQ and 3Pl NUI DAT, 1Pl at YS386650, YS377659 and YS374641, 2Pl YS370642. Night Locations: Coy HQ, 2Pl and 3Pl NUI DAT, 1Pl at YS375647, YS377659 and YS374645. Night Location: W Coy complete in lines at NUI DAT. Night Location: W Coy complete at Badcoe Club within 1ALSG VUNG TAU. Night Location: W Coy complete Badcoe Club VUNG TAU. 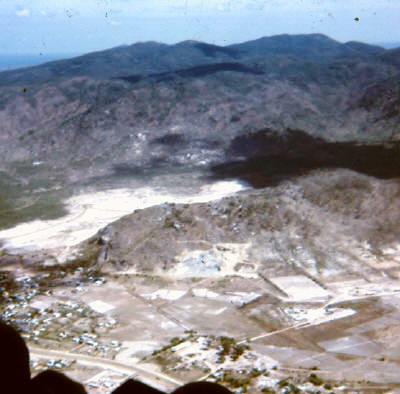 2RAR/NZ concluded Op CAPRICORN and returned to lines in NUI DAT. W Coy returned from VUNG TAU before noon and prepared to pass to under operational control of 8RAR. There must have been some official unhappiness with the way sub-units of 2RAR/NZ handled themselves during their first operation, as on 30 June the unit began a 1ATF directed refresher of Op LIFESAVER subjects, with all sub-units other than W Coy committed to further in-country training until 12 Jul. The programme required company's to undertake 2-days of range practises, mine warfare and mine familiarisation, ROE, as well as unit run courses such as NCO promotion, medical refresher, chainsaw training and destruction of blinds. 2RAR/NZ were warned that after 12 July they were to be prepared to relieve 8RAR and secure Route 2. In a move planned on 27 June HQ 1ATF passed W Coy to under OpCon of 8RAR from 300800H for operations until 9 Jul 70 as part of Op QUARTERMILE [locate and destroy D440 VC Bn]. 8RAR deployed W Coy to FSPB LE LOI by truck with the Company arriving about 1000H. W Coy remained c/s 5 but on the 8RAR command net. The Company task was to establish half-platoon ambushes in the vicinity of the BINH BA tri-village complex and around AP SUOI NGHE in an attempt to destroy elements of D440 VC bn. 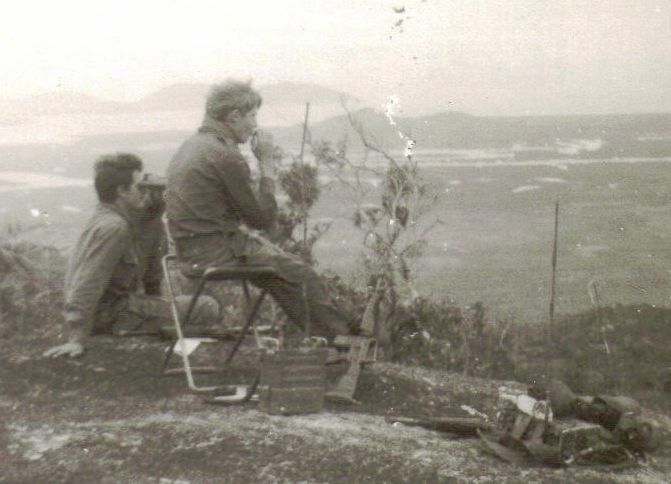 While at LE LOI W Coy were co-located with 161 Bty RNZA and were able to spend off-duty time on the gun-line. Rain fall figures are for NUI DAT.